Villa Beach Serenity features a main house spread over three floors which offers 5 double bedrooms with bathrooms and it is suitable accommodation for 10 guests. A separate apartment has one double bedroom, a shower room, living room, dining room, the kitchen and it is available for 2 additional guests. In total it can accommodate 12 guests. At the sea level, there is a private pier with stairs for smooth entrance to the sea. There is a small and shallow pebble beach right next to it, perfect for small children. Situated right above the pier is a beautiful stone paved terrace with barbecue. Along the waterfront, there is a small two-bed apartment with sea view terrace and seating above. The second level terrace offers a stone table for 10 perfect for breakfast, lunch or dinner in the fresh air while the third level features two apartments with double beds, each with its own bathroom. The fourth level offers a large, partly covered terrace with seating area and a dining area with table for 20 people and a large outdoor fireplace. 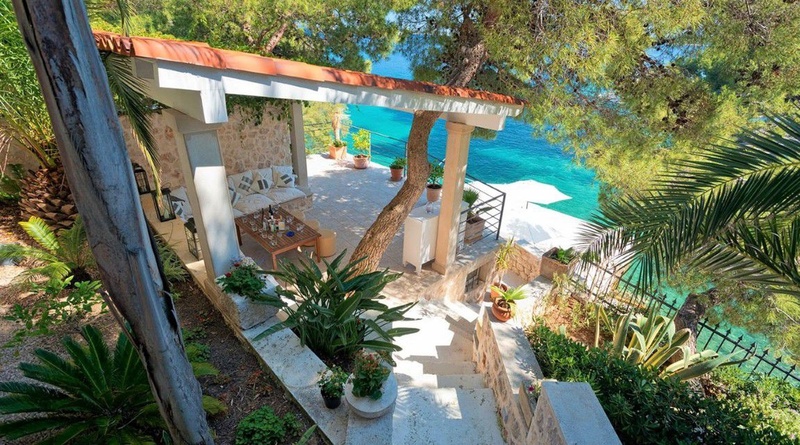 Villa Beach Serenity is surrounded with greenery, pines and palm trees ideal for a natural shade and beautiful flowers making it a perfect luxury accommodation in Hvar. There are only a few houses in the bay, which provides the feeling of exclusivity and complete privacy. Only a few minutes drive takes you to the centre of Hvar town, famous for its cultural heritage and vibrant nightlife.